I recently discovered a secret Greece has been hiding from the world. It's called Meteora. 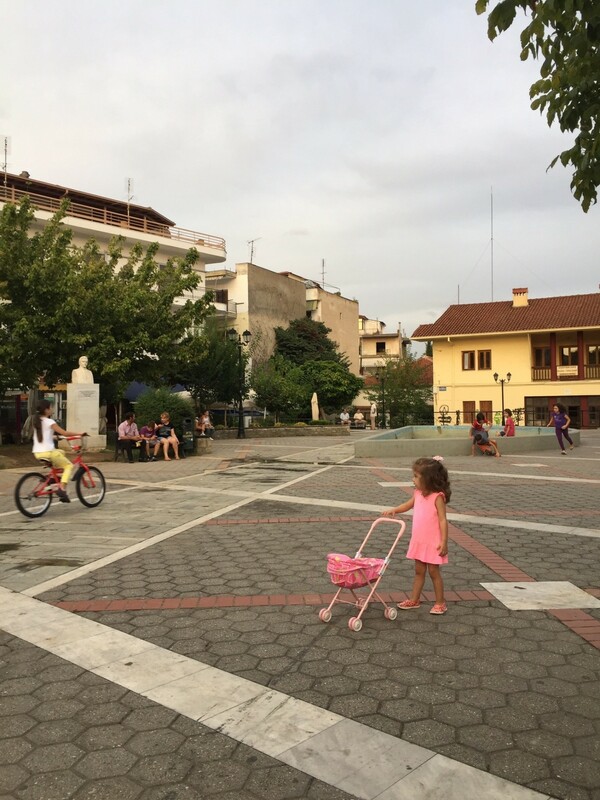 The town is a hidden gem, a few hours from Athens. Fully prepared to be swept off my feet by the island of Santorini, I fell in love instead with this magical place, now a UNESCO World Heritage Site. My dad was turning 70 in September. I don't know about you, but that felt like a big deal birthday to me. I could buy him yet another shirt, or a brand-name watch, although he can't even pronounce half those brands. Or I could get him golf clubs. Again. The clubs I got him for one birthday have collected so much dust in the closet there must be spiders weaving webs in there all day long. I was fast running out of ideas. So what do you do when you don't know what to get your dad for his big 70th? You book a flight to Greece of course! Well, it had also been my mom's desire to cruise the Greek isles so I figured combining one parent's desire with the other's "big deal birthday" was a good enough excuse to hit the land of the Spartans. Given it was mom's dream destination, I relinquished trip planning control to her. I knew we would be seeing Athens and Santorini but didn't know the rest of the itinerary. I mean, what else was there to see besides the usual islands right? September is supposed to be an ideal month crowd and weather wise so we were looking forward to the cooler temperature. 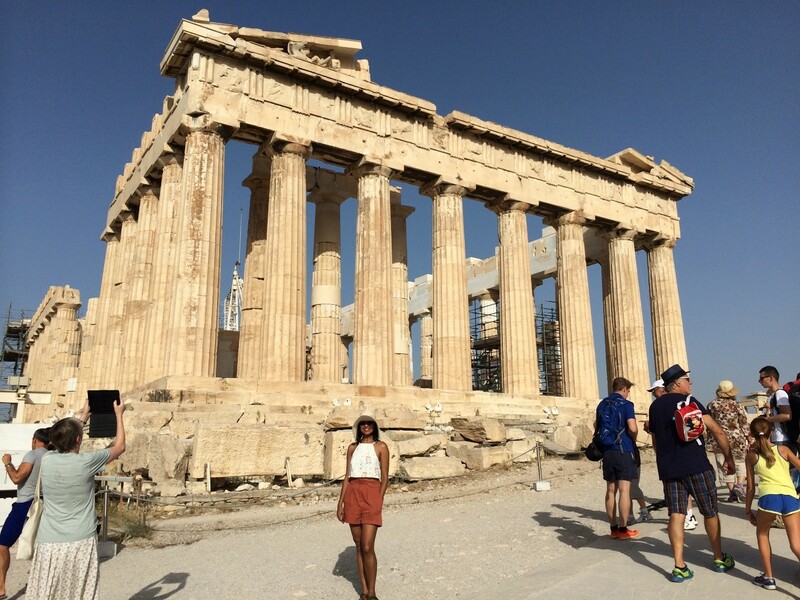 Our first stop was Athens. I won't wax poetic about the wonderful Parthenon, it was everything I expected it to be, except for the heat. I imagined a cool September breeze would caress my black tresses all day long except my hair was stuck to my scalp most of the time, with rivulets of sweat running down my face and neck at intervals. Charming indeed. After a few days in Athens, we set off on a road trip my mom had arranged to some town called Meteora. The countryside during the drive was non-descript and we arrived within a few hours. Driving into town, we were immediately greeted by a rocky terrain. As we turned a corner along the windy road, I gasped at the sight that came into view. Soaring to the sky were these imposing rocks, and clinging to the edge were beautiful buildings. We turned another corner and I spotted another stunning structure perched on top. I was looking at several monasteries built on what was natural sandstone rock pillars. From afar, the monasteries appeared tiny as they clung for dear life to the rocks, and the whole area felt mystical and fairy-tale like. Around 1344, Athanasios Koinovitis from Mount Athos brought a group of followers to Meteora and founded the Meteoron monastery. The only means of reaching the monastery was climbing a long ladder, which was drawn up whenever the monks felt threatened. The end of the 14th century saw the Byzantine Empire's reign over Greece at risk by Turkish raiders. 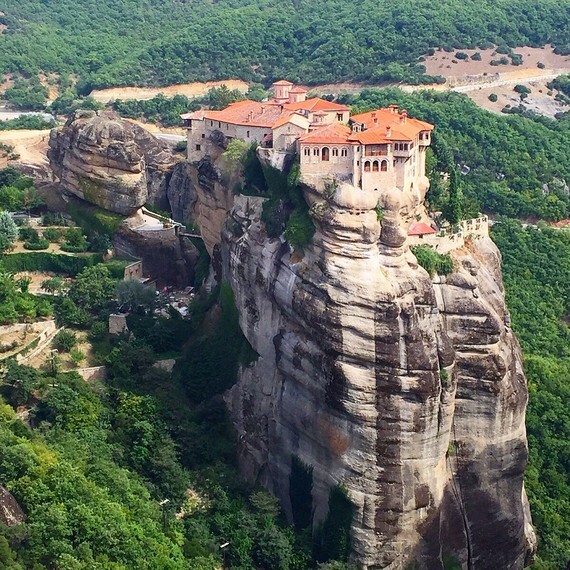 The hermit monks found the inaccessible rock pillars of Meteora an ideal place of refuge. Although more than 20 monasteries were built, only six remain today. The town is aptly named Meteora which in Greek means "suspended in the air." As I mentioned earlier, monastery access was purposely difficult. Long ladders or nets were required to haul up goods and people. Of course this meant you would have to trust the person pulling you up. In the 1920s, steps were cut into the rock, and you could access the monastery through a bridge. It's fascinating that until the 17th century, the only way to send things and people was by the baskets and ropes. Today, the monasteries are tourist attractions and can be visited by steps - phew, because I'm definitely not basket friendly! 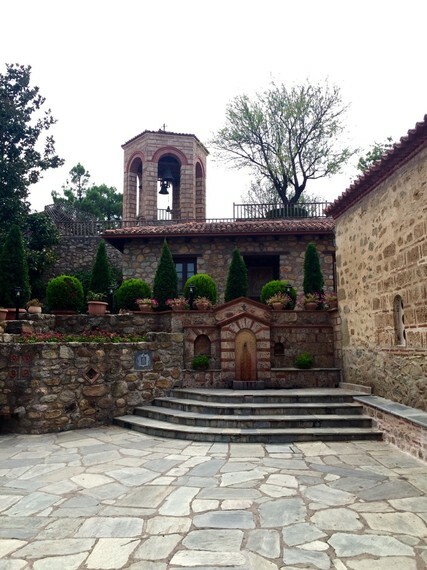 We halted for a night at the charming Dellas Boutique hotel, in the town of Kalambaka. The rooms were simple yet comfortable with balconies overlooking mountains. We woke up to a scrumptious breakfast spread that also consisted of home-made jams of different flavors. I was in jam heaven. After breakfast the next morning we drove to the first of the three monasteries we were visiting. 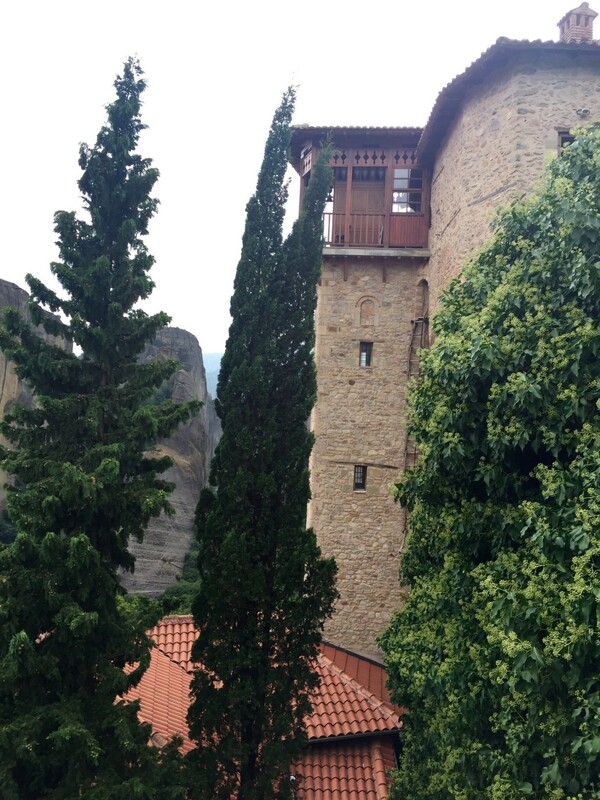 The Holy Monastery of Great Meteora is the oldest of them all. Because of the formation of the rock on top of which it was built, it's known as the monastery that was "suspended in the air." The central courtyard houses the main cathedral and is filled with beautiful 16th century frescoes. As we approached the summit, we were greeted with a spectacular view of the surrounding area and the Varlaam Monastery. We were able to visit the Sacristy inside as well as the old refectory of the monks, including the monastery's old kitchen complete with the original bread oven and soup hearth. We drove by the Varlaam Monastery but it was already closed, so we proceeded toward the Roussanou Monastery, said to have received the name of the first hermit who settled on the rock. Now compared to the other monasteries, this one is on a lower elevation and more accessible. Initially founded by monks, this monastery was damaged during World War II and became a convent in 1988. We were greeted by a nun who was providing scarves for anyone needing to cover their bare shoulders. Don't miss the beautiful wall-paintings of the Catholican. As I stepped inside the Sacristy, I wondered how these nuns and monks chose to stay in seclusion. I sat down for a while and felt an immense sense of peace wash over me. Could I trade in the chaos of the outside world for a quiet existence like this, I pondered. Later in the town square that evening, I watched little kids play with each other, instead of their face glued to some hand-held device, and realized everyone in the square was interacting with one another. I even saw a little girl pushing a baby stroller with a doll inside around the park. That's a sight I don't see in the parks around San Francisco, where I currently live. I sat for a few hours, basking in that same sense of peace that had overcome me while sitting inside the Sacristy of the monastery. Technology still hadn't taken over every single waking moment in Meteora and I truly felt aware of my surroundings. As we continued on our road trip toward Delphi, I realized I had just seen the jewel of Greece, a little off the beaten path town called Meteora. Experiential moments like these can be found even in a heavily tourist inundated country like Greece, you just have to be open to walking on the road less traveled. For more on Preethi's travels, check out at her blog at https://theeagertraveler.wordpress.com/ and Instagram.